All transactions are safe and secure with a reliable history in online purchasing behind each of our associates. 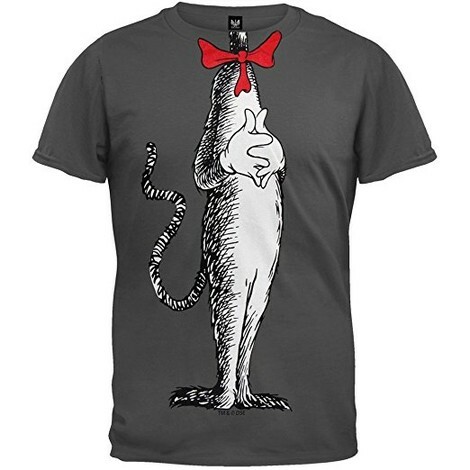 Buy the Dr. Seuss Cat in the Hat Costume t-shirt to own Dr. Seuss clothing and merchandise. Slip into this classic Cat in the Hat design and become the cat as you reread all of your favorite Dr. Seuss books like Horton Hears a Who!, which is about an elephant defending a planet the size of a piece of dust. He is the only one who can hear the cries of its little inhabitants, the Whos, asking for protection. Since only Horton can hear them, he is mocked until the Whos band together to make their presence known. Celebrate the book and movie by pairing this design with any of the Dr. Seuss costumes for adults. In addition to the Dr. Seuss Cat in the Hat Costume tee above, browse the Dr. Seuss Clothing Gallery for more apparel like men's and women's clothes, kids shirts or hoodies.